Another of Paris's pretty, dignified parks, this one near the Musée Nissim de Camondo in the northern part of Paris. Parc Monceau, in the 8th arrondissement north of the center of Paris (map), is another of those wonderful refuges from the bustle of city life. Though not as large as the Jardin du Luxembourg, still the Parc Monceau appears larger than it really is because of artful landscaping. Couples and families picnic on the grass, strollers and readers of newspapers enjoy the sun, children romp over an arched bridge, and an imitation "ruined temple" of classical columns stands serenely, its reflection floating on the surface of a placid pond. If you want to get away from the city streets, take the Métro to Monceau and you'll see the entrance to the park as you ascend to street level. If you're interested on beautiful home furnishings—tapestries, vases, marquetry tables, marble mantlepieces—and the graceful, elegant lifestyle of rich and famous Parisians, visit the Musée Nissim de Camondo at 63, rue de Monceau, on the north side of Parc Monceau outside the park. The Camondo mansion, now a division of Paris's Musée des Arts Décoratifs, is a treasure-house of rich furnishings assembled by a passionate collector of the art. 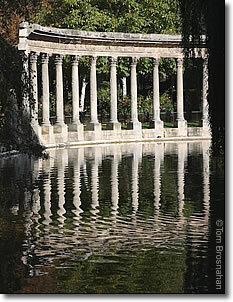 The "ruin" in Parc Monceau, Paris.